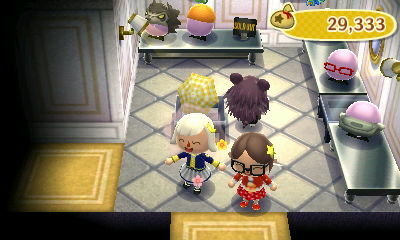 There was also some exciting news at the Able Sisters’ shop: I can use the QR Machine now! I actually haven’t used it yet, but I plan to in the future. I’ve been a bit disappointed by my neighbors’ lack of public works requests, and wondered if there’s a way of encouraging it a little. I read a few threads on AC forums about it, and some people think that your neighbors will suggest more community projects if you have a good relationship with them. Usually I don’t like to force the friendship process with my neighbors, and would rather it happen naturally. But I’ve decided to start putting more effort into being involved with them: doing more favors for them, going to their houses, having them over to mine, and writing them letters. I don’t know if it will help any, but it certainly won’t hurt! That night I got my second community project request! But I’m not saying it’s because of the letters or anything like that! It’s probably just random whether they request a project or say something else instead. The picnic blanket isn’t on my list of projects I want, but I do like it! Maybe I’ll think about building it, I can always demolish it later. On Sunday morning I was surprised to find Dr. Shrunk at my doorstep, bringing exciting news of a club he wants to build. Since a club would be a rather loud and flashy addition to Main Street, I had to make sure my neighbors were okay with it as well by having them sign a permission sheet. All of them seemed on board with the idea, so I finalized things with Dr. Shrunk, and it should hopefully be built soon! Belltune has Shampoodle, so I took the opportunity to get my hair done! I was getting really tired of that pink haircut… Once Shampoodle is built in my town, I’ll probably continue to play around with the color and cut, so this isn’t necessarily the look I always want to have for Estel. It’s morning in my town, but nighttime here — perfect for bug-catching! And I think it might have been Rain’s first visit to the island (or one of the first), so I bet she was adding lots to her encyclopedia. But in the middle of the Fall Bug Tour, WiFi crashed! >_< We were doing so well, too! But no matter, we all returned to Belltune, and now that it's 8 PM, Club LOL is open! Cliff-jumping back in Belltune! For a little while we tried jumping in unison, but it seems nearly impossible with four people. Back in my town, Kicks’ store was open for the first time! The polka dot rainboots match the toad parasol and toad shirt I have, so I thought it would be a cute outfit for a rainy day. I tried making my first path patterns for New Leaf. Nothing elaborate, but I think it’d look nice if it goes with the feel you want for your town. I want to have stone path patterns in my town eventually. A new bridge was built, but no one was there for the celebration (again 😛 ). I hope that having three bridges won’t stop requests for new styles of bridges! I’d like to replace some of these cobblestone bridges with different ones later. Aww 😦 When bringing him the day’s fossils, I found Blathers feeling down about the museum’s attendance. It seems better now than in previous games, at least! To help increase the museum’s attendance, he asked if I would contribute in funding the museum’s second floor, which will hold exhibits that the residents of Citàlune can choose. I have no idea what will be displayed there, but of course I still went ahead with the project! I grew my first rose hybrid! Now I just need to get my first tulip hybrid. I was able to get a matching cloud flooring and sky wall from my neighbors (being more social with them does help in adding more stuff to your catalog), so I thought I’d use the pair in Estel’s main room and re-do the furniture. 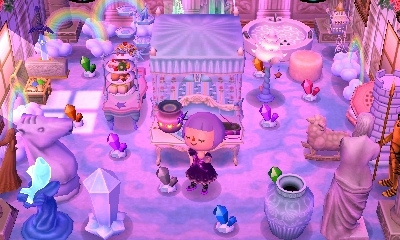 I don’t have enough white furniture to do this room properly (I had a room like this in AC:WW), but I at least prefer it to the mismatched assortment of items I had before. 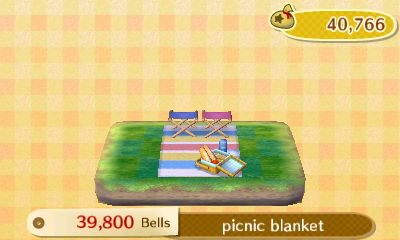 Posted on June 24, 2013 by Amy •	This entry was posted in AC:NL, AC:NL WiFi, Citalune and tagged Animal Crossing. Bookmark the permalink. I agree, AC has been a lot of fun ever since starting my blog! I got a notice a few days ago on my 2-year anniversary at WordPress, haha. I didn’t keep track of the days I talked to Sable, I’m sorry! But it didn’t seem to take too long, I’m sure you’ll get it soon as well! D’awwww, I love your cute red polka-dot rain outfit! So cute! 😀 How come you keep getting such a poor turnout at your ceremonies? My villagers have been prompt about attending. 😉 Also, the castle-in-the-clouds theme that you’ve got going on with Estel is lovely! I love watching how her house develops on the inside to compliment the outside! And Lyra! (Actually Lyra this time, not Violet… I got the two confused before :$) Will you go for the mermaid-themed exterior to match her beautiful undersea interior? Thanks, I enjoyed wearing it! I bought a yellow rain coat at the Able Sisters yesterday, so I’m hoping that some yellow rain boots might show up at Kicks. It’s handy to have some more outfits like this since it rains so much in my town! I’m glad you like it! 🙂 I do think the white furniture is more fitting for the image I have for Estel and her house than the random stuff before. The QR machine in the Ables’ is actually really useful, nobody really puts the standard gridded patterns up online anymore, so it’s an essential if you’re bad at designing (not that you are bad ^_^) like me. For now I’m just keeping gyroids in one of the exhibits, but I look forward to adding more interesting exhibits in the future. It’s such an awesome addition to the museum! Before, all museums were exactly the same, so they weren’t the most interesting to visit… it’s great that there’s some individuality and uniqueness to museums now, it’ll be fun to see what everyone does with the extra exhibits. Thanks! 🙂 I’d like to try to make my own path patterns for my town, but I definitely want to use others’ QR codes for dresses and things! I haven’t made many pro patterns before, so I’m pretty inexperienced with it, and I’ve seen some amazing ones! Maybe you know already, but there’s a great mens’ fashion blog of QR codes on Tumblr. And it’s so cool that you’ll be able to take pictures of codes and convert them into patterns! I was seeing codes on tumblr to copy patterns, and I was so confused!! It’s so cool that you get replies from the letters you send in New Leaf!! When you mentioned that trick of sending them 100bells to get profit, it just made me think, it’ll be soo weird for me to be trying to win money when I get ACNL, in WW I basically just never think about money, I have so much of it! Wooho!! Congrats on that orange rose, and your two rooms look amazing! I especially love the cloud room!! Kind of a long comment, hope you don’t mind 😛 Seeing the new Animal Crossing reminds me of the old times… it sounds kind of ironic, hahah. I prefer the names of the previous shops as well, like they changed Nook’s Cranny to Nooklings’ Junction… just doesn’t have the same ring to it, or the same classic feel as Nook’s Cranny. I guess they had to change the names because Timmy and Tommy run the shop now instead of Nook. Haha, that’s how I felt too! 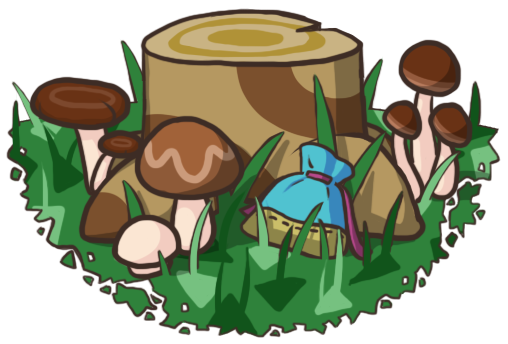 I was thinking, “I’m rich in AC:WW, how am I going to get used to being broke and trying to make money in AC:NL?” But I’ve actually had no problems with making money because of the island; you can make so much off of catching the bugs (especially palm tree beetles) there at night. It’s so cute, I can’t help but take pictures! And Kapp’n sings a song during the boat ride 😛 I like the mermaid furniture as well!